61% of all voters said it was very important Trump talk about improving the health care system; 60% said the same of the economy and creating jobs. After health care, independents most wanted to hear Trump talk about providing direction and leadership to the country. When President Donald Trump walks into the House chamber Tuesday to deliver his second State of the Union address, voters would much rather hear him talk about health care and the economy than about delivering on his signature campaign promise of building a wall at the U.S.-Mexico border, according to a new survey. The new Morning Consult/Politico survey of 1,993 registered voters, conducted Feb. 1-2, found nearly twice as many respondents said it was very important that Trump talk about improving the health care system (61 percent) and creating jobs and improving the economy (60 percent) than building the wall (33 percent), a divisive issue that in December helped trigger the longest government shutdown in U.S. history. As Trump prepares to address a more adversarial Congress than he’s seen in his past two major speeches in the House chamber, a senior White House official told reporters Friday that Trump plans to strike a bipartisan tone. While Trump is set to call again on Congress to support his proposed immigration policies, the White House official said the president will also focus on trade, foreign policy and efforts to reduce health care and prescription drug costs. 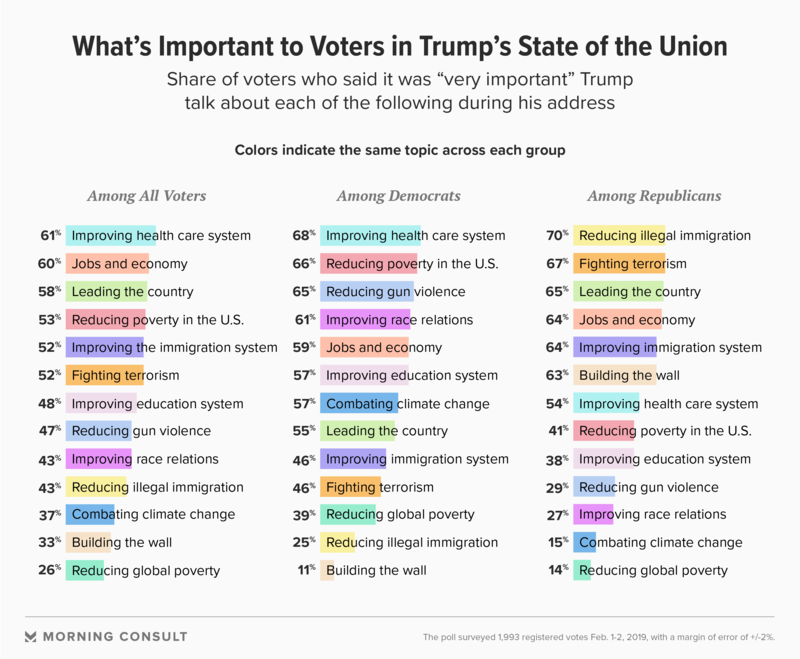 The survey found little agreement among Republicans and Democrats when it came to what was “very important” to hear in the speech. Reducing illegal immigration (70 percent) and fighting terrorism (67 percent) topped the list of priorities for Republicans. A slightly smaller share of GOP voters – 63 percent – said it was very important for Trump to discuss building the border wall, about the same share who said it was very important he broach the more general subject of improving the immigration system. For Democrats, the biggest issues are improving the health care system, reducing poverty in the United States and reducing gun violence. Independents most want to hear Trump talk about health care and providing direction and leadership in the country, with 58 percent and 56 percent of them, respectively, calling the two issues very important. The border wall is near the bottom of their list, with 28 percent calling it very important. Trump will take the stage Tuesday night coming off one of the worst months of his presidency. The monthly average of his net approval rating — the share of voters who approved of his job performance minus the share who didn’t — was 13 points underwater in January, a depth he’s reached in just two other months since taking office. The latest online poll, which has a 2-point margin of error, found 41 percent approve of his job performance and 56 percent disapprove. The speech offers him a large audience: According to Nielsen, 45.6 million people watched the speech in 2018 (five days later, 103.4 million tuned in to the Super Bowl). The poll found 51 percent of voters say they’re likely to watch the speech, with 29 percent saying they are very likely, similar numbers to last year’s pre-State of the Union survey.